I’m reading the One Hundredth Psalm on my patio this morning, coffee in hand, as a splashy redbird nonchalantly strips the needle-like leaves from the rosemary in my herb garden. In a flash, I am whisked away from my patio and am in the backseat of a blue Chevy Bel Air, racing along a two-lane road in the Florida panhandle, my thin blonde hair whipping in the wind, stinging my eyes. It is the summer of 1968 and from the dashboard radio, Jeanie C. Riley is belting out Harper Valley P.T.A. The acrid stink of a paper mill tells me Panama City Beach is just minutes away. A few miles short of town, my father pulls off the road beside an open-air rest stop. “Everybody out!” he commands with a smile. With a whoop of delight my brother and I leap from the car. My thighs peel away from the vinyl seat, leaving a pattern on the backs of my legs. For the next ten minutes we stand stock-still beside a roadside picnic table, arms extended like scarecrows while Dad slathers Coppertone on every exposed millimeter of our bodies—even the insides of our ears. 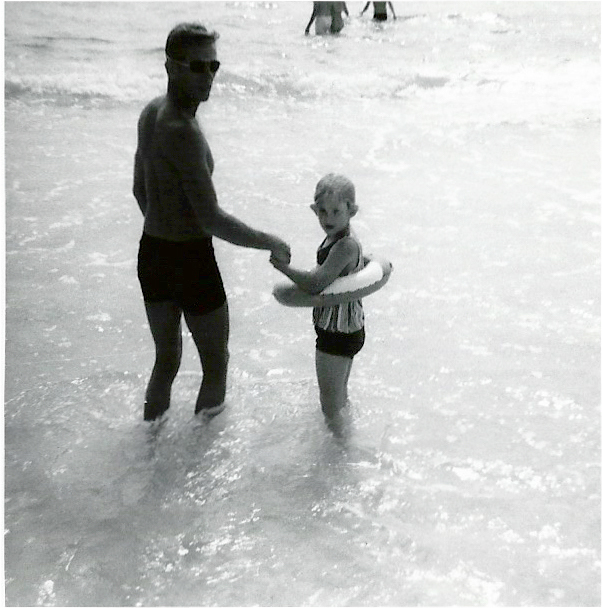 He always made sure we were wearing sunscreen before we hit the beach, knowing that the instant we arrived at the motel, my brother and I would bolt for the turquoise water of the Gulf, screaming like banshees across the white talcum sand. The parental care. The practical love. I still cherish them, all these years later. The Lord is good . . .
We don’t know a whole lot about the writer of Psalm One Hundred. One thing we can surmise with confidence, though, because it’s jumping up and down and waving at us from every line, is that the psalmist has experienced something of God’s love so tangible, it makes him or her bold to declare: The Lord is good. Sometimes God’s love and goodness show up through nature—a cheeky redbird in your herb garden. Or a welcome wave of cool air in September—God’s way of saying, “Chill, dear, I’ve got you.” Sometimes love is Coppertone in the hands of a caring parent, or a friend who forgives you when she has every reason to hold a grudge. Once, love became as concrete as a cross. The love of God is the one eternal reality; there is no other. When everything else has passed into shadow, what will remain is Love. The Lord is good; God’s steadfast love endures forever.